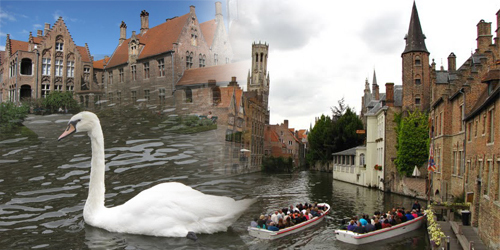 Just halfway between Brussels and Brugge, there is a city with a marvelous cityscape and canals, in some areas very similar to the ones in Brugge. 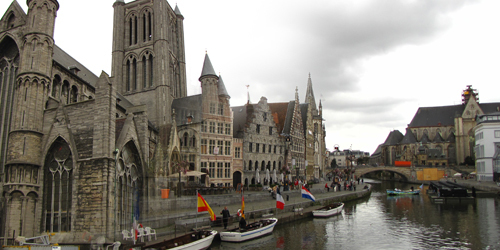 The city itself seems a bit larger than Brugge, after all, it is the capital of the East Flanders province: Gent. Gent is merely 56 kilometers away from Brussels, an easy ride by car, we were there in less than an hour. The city is very accessible by car, just follow the E40, then the signs into the city center. Pretty soon one can discover the signs marking the directions to the nearest parking areas. There are several parking places in the city, (and are really close to the city center) which are advised to be used, because there are a lot of pedestrian-areas which make driving around in Gent pretty difficult. The actual parking fee can be checked out on this website. The picturesque cityscape of Gent is marked by its three huge towers dominating the central area: the tower of St. Nicolas’ Church, the Belfry and the Saint Bavo’s Cathedral. St. Nicolas’ Church, though not very fancy, it is still is very imposing both from the inside and the outside. The Belfry is interesting because it has a whole museum inside, telling the story of the Belfry and of the bells used in it. The museum itself is arranged on different levels inside the Belfry, in the end leading up to the top of the Belfry, where a splendid view awaits the curious tourist. The entry ticket into the museum of the Belfry is €3.00 which is I think a bargain… About Saint Bavo’s Cathedral: it is very imposing from the inside also. It houses some great paintings of some of the most famous painters in the area. Sadly it is forbidden to take photographs, so I could not take any. Before someone embarks on a pointless exploration of the city: ask for a city map in the information office (under the Belfry). The walking-tour guide-maps are quite useful, because they show a pretty logical route in which to explore the city, with most of the highlights being touched by it. A little bit further away from the city center, just as one crosses the canal towards the west, lies the medieval Castle of the Counts. It is rare by the simple fact, that the entire fortress is in the heart of the city. Entry fee here is €8.00 per person. Another interesting thing, close to the fortress is the Great Butcher’s Hall, a very nice restaurant serving of course mostly meat. Oh and one more interesting thing close in the area: Gent has it’s very own Manneke Pis, it is not easy to spot, but there is one 🙂 . I have uploaded some of my pictures to my Picasa Account. Just 50 kilometers north of Brussels lies a city on the northern coast of Europe. It is not exactly on the sea, but through canals it has a direct port to the Northern Sea. The city actually has the second largest port in Europe (second to Rotterdam) and is the non-official capital of Flemish Belgium: Antwerpen. 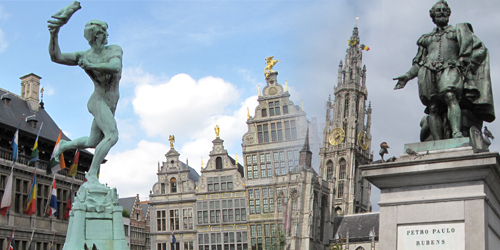 Since Antwerpen is so close to Brussels, we thought it would be a pity not to pay a visit. For this reason, last Sunday (getting closer to current time w. my blog entries 😀 ), we decided to go to Antwerpen. Since now we have a car at our disposal, we did not bother to go by train: we went by car, and found a parking spot… in Antwerpen Central Station… Actually it was OK to get there. The central station is marvelous: it combines old-style architecture with its old northern part with a modern, futuristic southern end. From the park we went to visit the city center: and we started with the Cathedral of Our Lady. It was intended to have two towers but only one was finished to its full size (which is enormous by the way). The cathedral holds some of the masterpieces of the famous painter: Rubens and when we were there there was an expo with some of his paintings. That is why an entry fee of €5.00 had to be payed, but for that at least we were allowed to take photos (without flash of course). The city center, Grote Markt was covered with huge scaffolds at the time of our arrival, so the center fountain, The Brabo Statue was turned off. Nevertheless these raised scaffolds offered a great support to take photos of the square from “the top”. Since we arrived a little late, we decided to visit one of the things which make Antwerpen known in the whole world: diamond. Antwerpen is the world’s diamond center, with much of the worlds whole diamond industry concentrating in this city. There is an entire Diamond District in Antwerpen, just next to the central station and there is also a Diamond Museum, which was our destination. The entry fee to the Diamond Museum is €6.00 (€4.00 for visitors under 25) but this includes an audio-guide, without which I think the whole visit would have been a waste of time. With these useful devices, however, it provides an abundance of information about diamonds and diamond trade. There is however much more to Antwerp than the things we managed to cover in one day: there is an excelent port, which we only saw from the car, there is a huge zoo (which is one of the oldest and most highly ranked in the world) and there is Europe’s first skyscraper (which we actually saw): The KBC Bank Building. Photos on my Picasa Account. Although not a very big city (compared to other major cities of Europe), its strategic position in world- and European affairs has made Brussels the Capital of Europe. Since moving here, I have felt this important state of the city everywhere: lots of official buildings, cars marked “CD” (Corps Diplomatique) and a lot of diplomats. The city however is also full of its cheerful local citizens and an even greater number of also cheerful tourists 🙂 . The whole central area is also packed with fabulous cathedrals and churches like the St. Michael and Gudula Cathedral for example (entry is free, so why not? 🙂 ). Not far away from the city center is the Royal Palace (which can be visited freely until 4 o’clock daily), and next to it the City Park (Brussels Park). From the park one can easily reach the European official buildings (The Europen Parlament for example) or the Schumann area (or Europe District) with its modern, glass buildings. From the European District the next park can be reached, the Cinquantenaire Park where the Cinquantenaire Arch is located. Next to the arch (on each side), there are two places to visit: Autoworld and the Military Museum (both covered in later posts). Bruxelles is also famous for its International Expos. 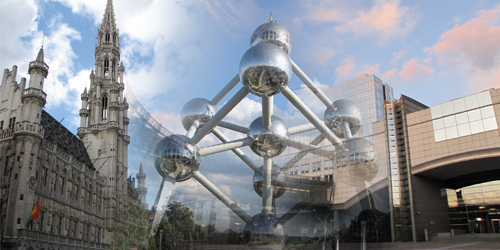 From the Expo ’58 a marvelous piece of architecture has still remained standing: The Atomium, which is a gigantic model of the unit cell of an iron crystal. One can go and visit most of the globes, which is pretty cool, for an entry price of €9.00. Right next to the Atomium is a small park called Mini Europe with miniature replica’s of famous buildings of Europe (much like Madurodam). It is also an information point of facts about Europe. The entry price here is €12.90. As one can see, the city is packed with exciting things to see and on top of that there are also a lot of festivals and shows: like the Beer Festival, which is held every year and is dedicated to Belgium’s most prized heritage: The Beer. So… this was just a taste of Brussels… more posts will probably follow about details 😉 . Some of the pictures I have taken so far are on my Picasa account. Close to the seaside, in the north-western part of Belgium, there is a small little town, about which perhaps a lot of people have heard about. If not from anywhere else, then at least from the Hollywood movie: In Bruges. Being a Flamish city I prefer it’s Flamish (Dutch) name better, which is Brugge (Bruges is the Wallonian (French) name). The city is situated very close to Bruxelles. A train-ride from Bruxelles central-station to Brugge takes about an hour or so. From the train station the city can be very easily visited on foot since it is not very big. There are tons of picturesque houses, adorable flower-beds and of course very romantic canals that tile up the town. There is not much to talk about this town. People simply have to go and see. It has some lovely parks, and quite a number of cathedrals out of which the Church of Our Lady is probably the most impressive. There is also a church in the lovely and quiet park of the Beguinage: a collection of small houses used by some sisterhoods of the Catholic Church. Other churches to visit are the Saint Saviour’s Cathedral and The Basilica of the Holy Blood. Probably the most impressive pieces of architecture are to be found in the center of the town in The Grote Markt, with the town’s Belfry taking away much of the splendor. The very nice houseline’s are also quite impressive and from the town-square they can be seen better. Other notable buildings are the Provincial Government Building and, just next to the Grote Markt, the City Hall. The best time to take photos in the town is in the evening, when all the buildings are lit and the shining splendor can be beautifully reflected in the canal waters. Sadly during my first visit, when I was in Brugge, I did not have a camera to make those photos. The second time, I could not wait until the evening because I had a train to catch back to Bruxelles. Some of the photos I made can be viewed on my Picasa account. Our first weekend in the Belgium started off with a slight dilemma: what can we visit in Belgium (or in the region), having a car at our disposal? Most of the landmarks in the region are easily accessible by train, so we needed something special, a trip which could use the most out of the existence of a car. We decided to visit more than one place in one day. 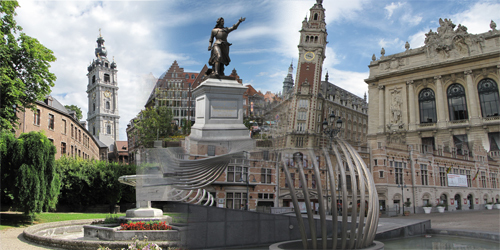 Our target area was the western part of Belgium in the metropolitan area of the French city: Lille. Actually we have had several target cities/towns, but in the end we only had time to visit 3 towns and Lille. Our first town to visit was Mons. This little town is situated to the south-east of Lille. It is famous for its beautiful architecture and of course its cathedral, the Sainte Waudru collegiate church and the neighboring belfry, which is considered a World Heritage site. The town hall of Mons also has a small monkey statue on its side, it is said, that touching it brings you luck 🙂 . I have uploaded photos of Mons on my Picasa account. The next town to visit, was Tournai a town also famous for its belfry and its Notre Dame cathedral. The main square is also very nice, filled with cafes and restaurants. Photos of Tournai have been uploaded also to my Picasa account. We visited its Cathedral (also called Notre-Dame), then walked through its quite nice shopping streets towards the city center. The center is also very nice. When we were there, there were a lot of people there, with street performers presenting their skills and lots of candy-stands. Photos on my Picasa account. We still had time to visit one more city. We chose to visit Kortrijk. This town is located on the eastern part of Lille, again in Belgium. We visited its main square with its very nice medieval city hall, strolled down the streets towards the Saint Martin tower. An interesting thing to note is the presence of loudspeakers everywhere in the city with music playing anywhere one went in the city center area. It was actually not disturbing and a quite nice thing to have. There are photos of this town also in another Picasa album.